Does this thermometer contain mercury? This thermometer does not contain Mercury. 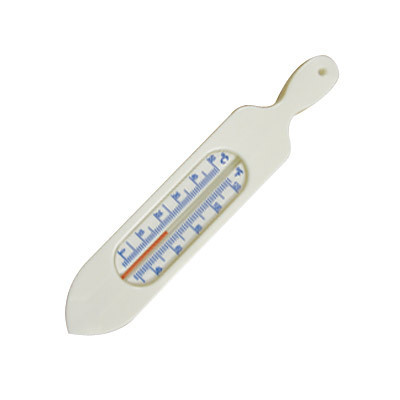 Suitable for the old and the young, our Bath Thermometer is a handy tool to ensure your residents and patients never step into a boiling hot bath. Reducing the risk of injury, this hand held tool can be lowered into the water easily while the grip handle prevents the possibility of scalding for the user. Ideal for checking baths for young children or for the less able and providing an accurate reading when used correctly, this reliable tool also features a small drilled hole on the handle making it ideal for storing next to the bath or in your bathroom drawer. The clear display on the front has easy to understand markings and can deliver a response in minutes while also being fully water resistant for reliable use. Gompels also stock a range of thermometers for care home use including our Dishwasher Safe Waterproof Thermometer and a Room Wall Thermometer.